Venus, the brightest planet in the evening or morning sky, visible from Earth, is often mistaken for a star and referred to as the Morning Star or Evening Star, depending upon it's position, relatively to the Sun and Earth. It's surface features are hidden under thick layer of clouds of sulfuric acid and highly dense atmosphere, which consists mostly of carbon dioxide. As it moves around the Sun during year, observers from Earth can see it in different phases, similar to our own Moon. As Venus moves closer to Earth, it's apparent angular size increases and it becomes visible only as a beautiful thin crescent. 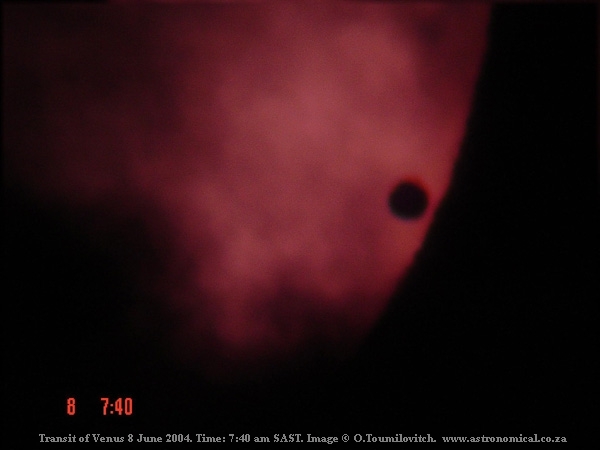 On June 08, 2004, Venus was observed by millions of people as it moved between the Earth and the Sun- the event, named The Transit of Venus. 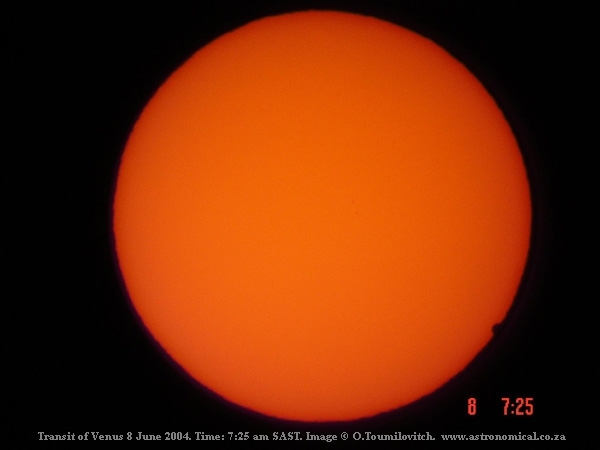 For those, who did not see the transit of Venus in 2004, there is another chance on June 05-06 2012. 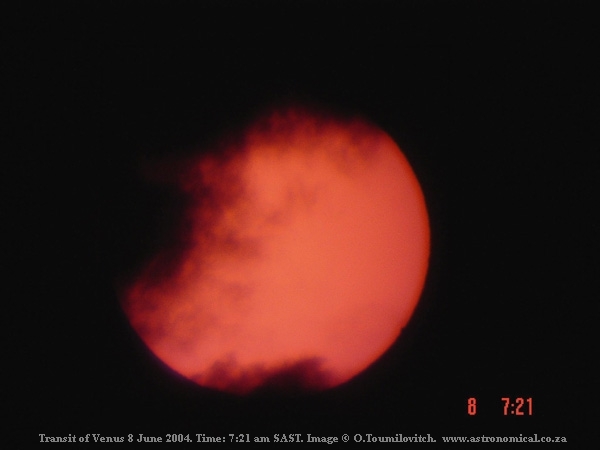 I was fortunate to observe and photograph the 2004 Transit of Venus and I hope that this web page will take back in memory those who also witnessed this wonderful event and will provide some useful information to those who are planning to observe the 2012 Transit of Venus. Thank you for visiting and enjoy! When Venus is very low above the horizon, the light, reflected from it's atmosphere is subjected to an optical effect, called refraction, as it passes through the Earth's atmosphere. Rays of light at different wavelengths are refracted at different angles, this results in rainbow-like optical effect, when blue and red colors are prominent on the opposite sides of a bright object. This can be also observed with other planets, Moon and the stars. The original image is on the left hand side, while the image on the right hand side has been edited. Just two weeks before the 2012 Transit, Venus shines brightly just after the sunset and it's beautiful crescent is even visible thought a pair of small binoculars. 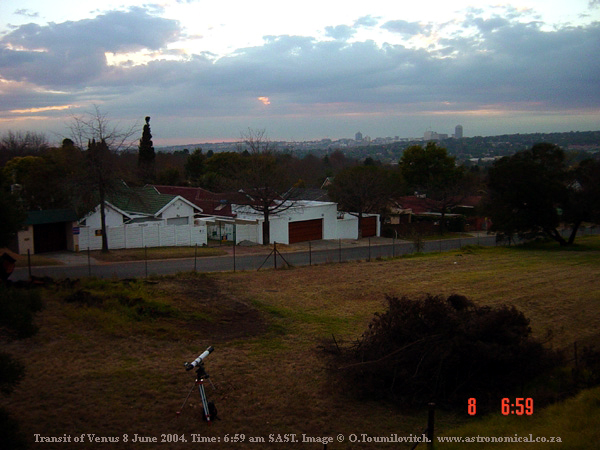 On June 08, 2004 I've decided to start observation from a spot in Delta Park, north of Johannesburg, which offers magnificent panoramic views of Eastern horizon, Johannesburg, Rosebank and Sandton. Unfortunately at the time of first contact the whole Eastern horizon was covered with the clouds and I wasn't very optimistic as I still needed to test the equipment, but the Sun just wouldn't show up. Telescope, chosen for this event, was TAL-100 refractor telescope with motorized equatorial mount. Focal length of 1000 mm is perfect for observing full-size Moon and Sun with middle-power eyepiece. It also is very well suited for photography of these objects with middle format DSLR camera at prime focus. But at that point of time I had available only a small digital camera and a camcorder. Two different solar filters (TAL 1 1/4" eyepiece type filter and self-made front aperture filter) and self-made mechanical coupling adapters for cameras and the 25 mm TAL Super-Plossl eyepiece, x2 TAL Barlow lens for close-up viewing were ready. Also, it is essential to have a pair of Eclipse viewers, which are normally available for purchase from your favorite astronomy equipment supplier or from a local Planetarium. During next ten minutes or so, my wife Natalia, daughter Alicia, our neighbors Peter and Kay and several other people who were on their way to work, stopped by and witnessed the beginning of transit live on the LCD screen of my Sony Cybershot digital camera. Soon after, the clouds have come back and I have decided to continue from the garden at our home. Brightness, contrast and saturation adjustments improved details and gave another dimension to what normally would look like flat disc. 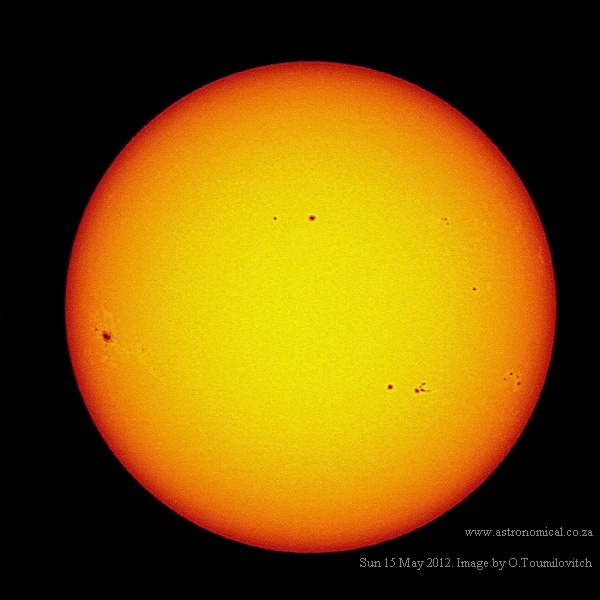 The image clearly shows sun spot group 627in the center and Venus in transit. In this and the following image Venus appears to have very irregular shape. This is due to couple of factors: the refraction of sunrays by the Venus's atmosphere, strong atmospheric turbulence and the shutter speed of the camera. lower ISO and longer shutter speed would produce more round image, with with smoother edges. Similar effect could be achieved by stacking a number of images, taken within very short period of time. 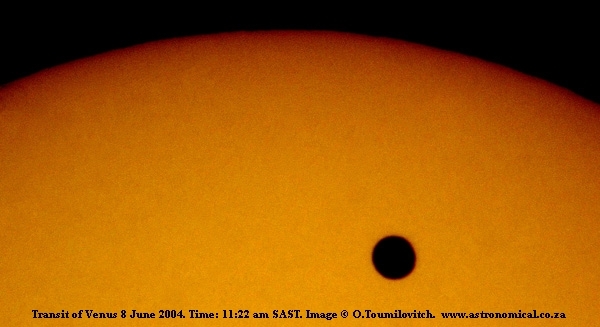 By 13:00 it became clear, that the transit is almost over and I suddenly started feeling that disc of the Venus is moving closer to the edge of the disc of the Sun faster and faster- an illusion, similar to observing the Moon as it moves down and later starts to disappear behind the horizon. At this point of time all remained, was to continuously take images one after another until the Venus was completely gone from the view. And then, it was all over! I rushed to the computer, impatiently waiting until last image had been downloaded and started checking the last batch of the images, looking for.. you know.. So called "Black Drop effect" is clearly visible in my images- something I am very proud of. This is how the camera and camcorder are mounted to the eyepiece of the telescope (images were taken later, just for demonstration purpose). This type of astro-photography produces very good results especially for lunar and planetary photography. Normally the digital camera will have an optical zoom, efficient for taking close-up images without the need of a telescope with the longer focal length. So, what's next? 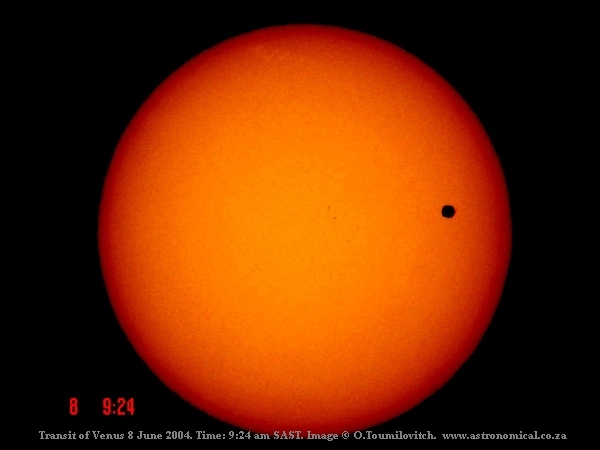 Venus is on it's way to cross the line of sight between the Earth and the Sun again! 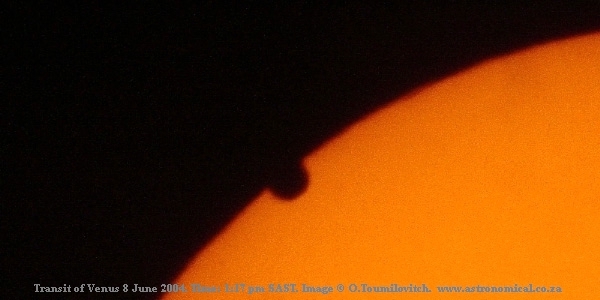 This will be the second chance for us to witness the Transit of Venus! 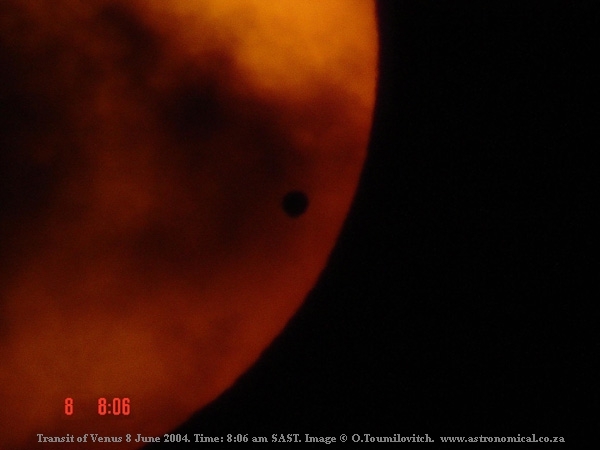 No one, who is alive today will be around to witness the next Transit of Venus from Earth- it will happen only in year ... But on the other hand, as the saying goes, "Never say Never". The 2012 transit is promising to be so special! With the advances of technology and technology becoming so easily accessible, I expect to see the images of Venus in transit like we've never seen before. Unfortunately, this time I will be myself in transit, together with my family- we will be moving to another house and there is no way we could travel out of the country to once again see the little black hole in the Sun. But I am looking forward to see your images and have them on this web page for others to see. Scroll down for few tips. First of all, always remember to take precautions when observing the Sun and make sure, that children are not left at the telescope unattended. Don't forget to install solar filter onto the optical finder scope too or close it's objective with the lens cap and secure it with the tape if you can work without it. Don't wait until the day comes- prepare and test your equipment before the time. 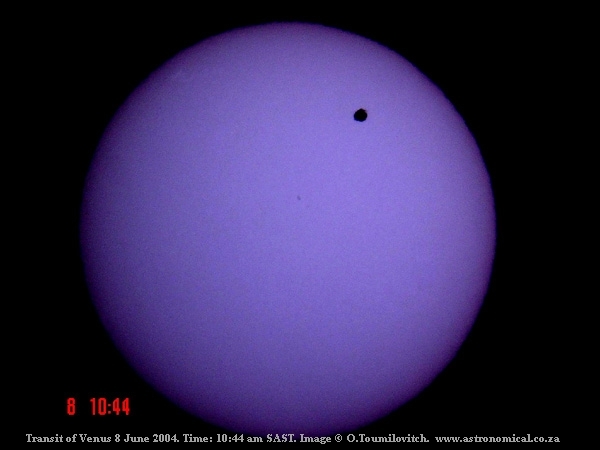 Imaging of transit is very much the same as imaging the sun through any type of solar filter. Important point is, try to take complete sequence of images through fixed time intervals, say every 5 minutes through the whole transit in progress, but much more often just before , during and after contacts I, II, III and IV and try to photograph "Black Drop effect". 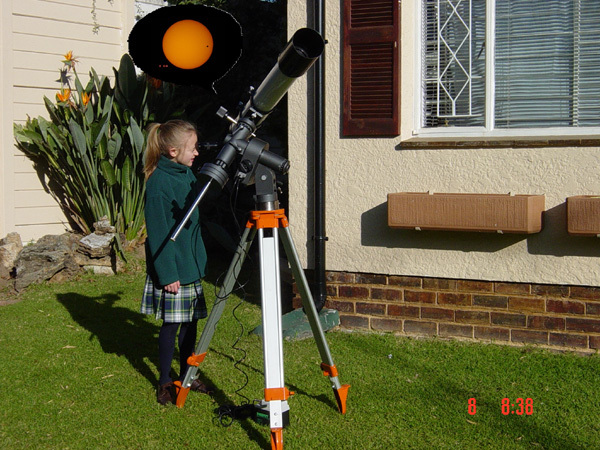 Equatorial mount with tracking or Alt-Az telescope on equatorial wedge is preferred if you plan to make an animation of the whole transit. Align the mount a day or two before, so that you don't need to spend time on this when there are more important thing to worry about. In fact, it will be simply impossible to align the mount accurately during the day. Equatorial mount is essential to exclude any field rotation as the telescope is tracking the Sun. If your camera is equipped with the LCD screen, which can be tilted, do not use any diagonal prisms or mirrors- they can reduce the quality of the images. Orient the camera in such way, that left and right parts of the image are aligned with West and East, i.e. along ecliptic. North will be at the bottom of the image for Southern hemisphere and at the top of the image for the northern hemisphere or vice-versa if a diagonal accessory is used. Fix the camera and leave it in this position for the whole duration of the transit. If you are using DSLR camera and by some reason you need to remove it from the telescope, disconnect it from the T-ring, but do not remove the T-adapter. When you re-install the camera, it'll be oriented exactly the same way as it was. And of course, the batteries! Have them fully charged and get the spare battery for the camera and for the telescope. And as I often say: "NO FLASH!" ..and don't hesitate to e-mail me a question or two if you need some assistance with the preparations.